Canada and the European Union last Friday reached a political agreement on the key elements of a Comprehensive Economic and Trade Agreement (CETA) after months of intense negotiations between EU Trade Commissioner De Gucht and Canadian trade Minister Ed Fast. It will be the first free trade agreement between the European Union and a G8 country. Boosting trade relations with Canada will generate new opportunities for growth and the creation of jobs in the EU. On the basis of this political breakthrough, the negotiators will now be able to continue the process and settle all the remaining technical issues. Subsequently, the agreement will need to be approved by Council and Parliament. The EU-Canada agreement will remove over 99% of tariffs between the two economies and create sizeable new market access opportunities in services and investment. In the area of government procurement, Canada has not only taken commitments at the federal level, but has also opened its sub-federal level to European bidders to an extent never done before, thereby creating unique new opportunities. Amongst the many benefits, the agreement will also improve the protection of intellectual property rights in Canada as well as the protection of the names of our flagship agricultural products. Once implemented, the agreement is expected to increase two-way bilateral trade in goods and services by 23% or €26 billion, fostering growth and employment on both sides of the Atlantic. The overall benefits of the agreement are expected to raise the level of the EU’s annual GDP by approximately €12 billion a year. Besides bringing almost all tariffs to zero, CETA will also liberalise trade in services, in particular financial services, telecommunications, energy and transport. For the first time ever, all Canadian levels of government will open up their public procurement markets to European suppliers. CETA will also bring the Canadian protection of intellectual property closer to the level of the EU, benefitting the pharmaceutical sector and exporters of agricultural products of specific geographical origin known as GIs. The EU and Canada have also reaffirmed their strong commitment to the principles and objectives of sustainable development in trade. This means that the investment and trade should not develop at the expense of the environment, but rather foster mutual supportiveness between economic growth, social development, and environmental protection. In 2012 Canada was the EU’s 12th most important trading partner, accounting for 1.8% of the EU’s total external trade. Based on 2011 figures, the EU was Canada’s second most important trading partner, after the US, representing 10.4% of Canada’s total external trade. 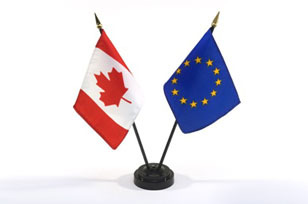 The value of bilateral trade in goods between the EU and Canada was €61.8 billion in 2012. Machinery, transport equipment and chemicals dominate the EU’s exports of goods to Canada, and also constitute an important part of the EU’s imports of goods from Canada. As advanced economies, trade in services such as professional services, transport, banking, and insurance is an important aspect of the EU-Canada trade relationship. Equally, investment remains the most important mechanism through which services are delivered and manufacturing may be carried out. In 2011, the EU’s investment stock in Canada was around €220 billion while Canadian investment in the EU amounted to almost €140 billion. The Comprehensive Economic and Trade Agreement (CETA) between the EU and Canada will generate substantial new trade in goods and services as well as additional opportunities for investment. The new market access provided by the agreement will further improve the position of EU exporters and investors on the Canadian market. Once implemented, the agreement is expected to increase bilateral trade in goods and services by 22.9% or €25.7 billion, fostering growth and employment on both sides of the Atlantic. Overall, the EU-Canada agreement could lead to GDP gains for the EU of up to €11.6 billion per year. Eliminating duties – this will happen quickly with most of them going as soon as the agreement enters into force. Overall, both sides will fully eliminate tariffs on more than 99% of all tariff lines. Industrial tariffs – these will be fully liberalised saving EU exporters an expected around €500 million (almost C$ 700 million) in duties a year. In other words, EU exporters will be relieved of the costs of paying tariffs when selling goods on the Canadian market. Agricultural tariffs – Canada is a very valuable export market for EU agricultural and processed agricultural products, with annual sales of over € 2.9 billion. The agreement will rapidly – largely at entry into force – eliminate duties on agriculture. By the end of the transitional periods, Canada and the EU will liberalise, respectively, 92,8 % and 93,5 % of trade lines in agriculture. As regards products considered sensitive: dairy for Canada and beef, pork and sweet corn for the EU, it has been agreed that new market access, amounting to a further 1 % and 1,9 % of tariff lines respectively, will be granted in the form of tariff rate quotas. On prepared agricultural products (PAPs) more specifically, which are a major EU export interest and where the EU has a major export surplus with Canada, the outcome is particularly ambitious. The EU PAPs industry will considerably gain from CETA as all the PAPs tariffs will be eliminated. Wines and spirits deserve a special consideration within the PAPs group for their particular export relevance. The EU is Canada’s major import source of wine – about half of its imports. The tariff elimination here is complemented by the removal of other relevant trade barriers which will significantly improve access to the Canadian market for European Wines and Spirits. Fisheries – most duties will be eliminated at entry into force. Besides tariffs, the fish package also includes other elements of interest to EU firms, such as better access to Canadian fish for the EU processing industry. Sustainable fisheries will be developed in parallel, in particular with regard to monitoring, control and surveillance measures, and the fight against illegal, unreported and unregulated fishing. Non-tariff barriers (NTBs) – the chapter on technical barriers to trade (TBT) contains provisions that will improve transparency and foster closer contacts between the EU and Canada in the field of technical regulations. Both sides also agree to further strengthen links between the relevant standard setting bodies. A separate protocol will improve the recognition of conformity assessment between the parties. By reducing the cost of complying with technical regulations, standards and conformity assessment procedures (including marking and labelling provisions) CETA will facilitate trade and benefit industry generally. According to estimates, this could amount to GDP gains of up to €2.9 billion a year for the EU. Automotive sector – Canada will recognise a list of EU car standards and will examine the recognition of further standards. This will make it much easier to export cars to Canada. SPS – CETA consolidates the existing EU-Canada Veterinary Agreement and creates a more predictable environment for EU exporters of plants and plant products. Trade in services – around half of the overall GDP gains for the EU are expected to come from liberalising trade in services. CETA will bring new opportunities for European companies by creating access the Canadian market in key sectors such as financial services, telecommunications, energy and maritime transport. The GDP gains for the EU could amount to up to €5.8 billion per year, once the agreement is fully implemented. Temporary movement of company personnel – to support trade in services and investment, CETA will make it easier for firms to move staff temporarily between the EU and Canada. This will make it easier for European companies to run their operations in Canada. Certain categories of professionals will also have easier access to temporarily supply services such as consultancy in a variety of sectors like engineering, accounting or architecture, simplifying the fulfilment of after-sales maintenance and monitoring commitments. Mutual recognition of qualifications – the agreement provides a framework for a future mutual recognition of qualifications in professions such as architects, engineers, and accountants. At the moment, the lack of coherent requirements for professionals remains a critical barrier, especially for providing cross-border services. Under this framework, the relevant professional organisations or authorities in the EU and Canada now have the possibility to further jointly work out the technical details of a mutual recognition and bring these under CETA. Investment – one of the key pillars of economic relations between the EU and Canada, with combined EU and Canadian FDI stocks amounting to €360 billion in 2011. The agreement will remove or alleviate barriers to investment both horizontally and in specific sectors, improving legal certainty and predictability for businesses. As a result of the changes made by the Lisbon Treaty regarding EU competence on investment, the Commission has negotiated provisions to protect European investors in Canada, ensuring non-discrimination, a fair and equitable treatment and appropriate compensation in the event of expropriation. This is in line with EU Member States best practices in their existing Bilateral Investment Treaties (BITs). At the same time, the investment protection provisions fully preserve the right of the parties to regulate and implement their public policy objectives. Underpinning the investment protection obligations will be a modern and effective investor-to-state dispute settlement mechanism. Public procurement – CETA covers new ground as it is the first time that all sub-federal levels of government in Canada have committed themselves to bilaterally opening their procurement markets. An EU-Canada Joint Study (2008), found that the overall value of contracts awarded by the federal government was estimated at C$ 15 to 19 billion per year. The value of contracts at other levels of government is considered to largely exceed these numbers. For example, in 2011 procurements by Canadian municipalities was estimated at C$ 112 billion (approx. €82 billion) or almost 7% of Canadian GDP. Canada will also create a single electronic procurement website that combines information on all tenders and access to public procurement at all levels of government. This will make it much easier for European suppliers to compete in the Canadian procurement market. Intellectual Property Rights (IPR) – CETA will create more of a level playing field between Canada and the EU. The agreement should in particular lead to developments in the Canadian IPR system regarding pharmaceuticals. The chapter also includes provisions – amongst others – on trademarks, designs and copyrights, and overall it reflects high standards for IPR protection. Geographical Indications – CETA recognises the special status and offers protection on the Canadian market to a list of numerous European agricultural products from a specific geographical origin, so-called Geographical Indications (GIs). Examples are Grana Padano, Roquefort, Elia Kalamatas Olives or Aceto balsamico di Modena. The Agreement also provides for the possibility to add other products’ names to the list in the future. In addition, thanks to the agreement, some prominent EU GIs such as Prosciutto di Parma and Prosciutto di San Daniele will finally be authorised to use their name when sold in Canada, which was not the case for more than 20 years. Dispute settlement mechanism – CETA provides for an efficient and streamlined horizontal mechanism covering most areas of the agreement. The system is intended as a last resort should the parties fail to resolve disagreements relating to the interpretation and implementation of the Agreement’s provisions by other means. It proceeds along a fixed set of procedures and time-frames. Should parties fail to reach an agreement through formal consultations, they can request the establishment of an arbitration panel, made up of independent legal experts. Mediation – a mechanism for mediation is also available on a voluntary basis to tackle measures that adversely affect trade and investment between the Parties. Sustainable development – the EU and Canada have in CETA also reaffirmed their strong commitment to the principles and objectives of sustainable development. This means that investment and trade relations should not develop at the expense of the environment or of social and labour rights, but instead foster mutual supportiveness between economic growth, social development, and environmental protection. The Trade and Sustainable Development chapter will set up effective mechanisms for the involvement of different representatives of EU and Canadian civil society in the implementation and monitoring of the relevant provisions and include a dedicated arbitration mechanism, including government consultations and a panel of experts. As the US and Canada have already liberalised their trade under the North American Free Trade Agreement (NAFTA), this agreement will allow EU companies to compete with US exporters on the Canadian market by levelling the playing field, while in addition benefitting from preferential treatment going beyond NAFTA (for example in government procurement, and in certain services sectors, such as maritime transport).